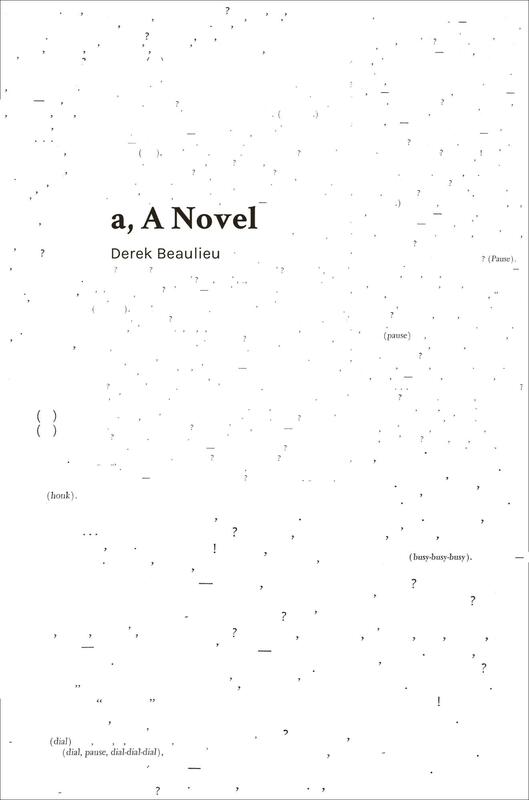 a, A Novel, Derek Beaulieu. Jean Boîte Éditions (2017). 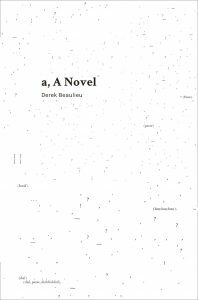 As the first entry in Jean Boîte Éditions’ new series of Uncreative Writing, Derek Beaulieu’s lengthy erasure poem a, A Novel is as unabashedly derivative as it is visually engrossing. Beaulieu subjects Andy Warhol’s a, itself a novel derived from audio recordings, to a rigorous process of erasure, leaving only the punctuation marks and onomatopoeic words inserted throughout by Warhol’s transcriptionists. When opening the book, one cannot fail to notice an epigram from Adorno’s Signe de ponctuation inviting a reading of punctuation as musical notation. Parallels are immediately drawn between punctuation as sonic score and the work’s onomatopoeic words; that is, between strictly silent typographic marks and a transcription of real-world sounds. Taken altogether, the document’s remaining material reads more like stage directions than a score, as though the metaphysical currents underlying a sequence of real-world events were laid bare. Stripped of dialogue, the newly anonymous punctuation becomes a vessel filled with infinite, though controlled, possibilities. When I flip through the pages of a, A Novel, I am reminded of a book of star charts, punctuation marks organized on a white expanse like hundreds of constellations superimposed over an invisible grid. It’s human nature to identify patterns in such systems; whether any exist or not is another question. What, of these markings, is a product of Warhol’s genius? Punctuation is, of course, imposed on recorded dialogue by typists after the fact, and this leads away from receiving punctuation disambiguated from its text as a meta-textual score. Instead, punctuation is prosthesis to audible dialogue, signifying what would otherwise be clear from context, tone of voice, or body language. Punctuation accretes like foreign minerals in the seams of a fractured rock, filling in and propping up material that might otherwise fall apart. Beaulieu’s erasure of the dialogue effectively foregrounds this accretion and the conditions of its formation: as Gilda Williams points out in her afterword to a, A Novel, transcriptions of the audio tapes were performed by a handful of young female interns. Many of the idiosyncrasies which distinguish a stem from these women, be they typographic errors, stylistic flourishes, non-verbal interjections, or the inclusion of background noise. Williams writes, “for all his socio-creative forward-thinking, Warhol held notions of gender appropriateness that were fairly typical of a man of his generation.” Coupled with how infamously little Warhol valued labour, the typists received little credit for their contribution to the work (471). The remaining punctuation then stands in for these women’s work taken for granted in the publication of Warhol’s original text. Even more than the punctuation, onomatopoeic words and other transcriptional interjections (qualifiers like descriptions or durations) concretize what is possible within all this blank space. Bracketed notations indicate sonic barriers which limit and orient the reader in environments at once spatial (the white page-plane) and temporal (the event transcribed, lurking beneath the page). It is unlikely that sounds of “(Opera) … (opera)” emanate from a hospital setting (257), nor those of “(cars honking, blasting)” from a library (7). These notations, transcriptions of real-world phenomena, delineate all possibilities secreted by erasure. Taken alongside the punctuation-as-silent-score, these elements become boundary conditions for existence within the framework of a novel. Take for example, “(60-second pause and the sound of washing feet)” on page 94. The insertion of a minute-long pause in the transcription by a typist enforces a barrier of one extreme: that of non-existence. Then we have the sound of washing feet, which, outside of the context provided by Warhol’s erased dialogue, would be otherwise unintelligible; perhaps only perceived as splashing water. What is the sound of washing feet? This imposition on a sound, or rather, a constraint on the interpretation of a sound, forms a barrier in opposition to the pause, one of definite material existence. Between these bookends lie the infinite possibilities implicit within any single novel. Punctuation is separated from its prose, just as the erased dialogue is freed from the form of its typographical confines. Beaulieu may not ‘create’ in the traditional sense, but he does unshackle. Warhol’s literary offering to the cult of personality dissolves under Beaulieu’s eraser into near total impersonality, reduced to the boundary conditions of its own fictional space, a reduction transforming it into the boundaries of every other fictional space as well. Kyle Flemmer is an author, editor, and publisher from Calgary. He founded The Blasted Tree Publishing Company in 2014. Kyle’s most recent chapbooks are Astral Projection above/ground press, 2017, Lunar Flag Assembly Kit, no press, 2017, and PRAY/LEWD The Blasted Tree, 2016.